Nercon's recetrack-configured conveyor loop displays a variety of adjustable guide rail assemblies, control solutions and safety and energy monitoring demonstrations. It’s up to Nercon to work with the production team to optimize the conveyor line with an equipment and controls solution that provides the best changeover efficiencies for the application with adaptability and flexibility for the future. At PACK EXPO 2012, Nercon will showcase its Conveyor Changeover Efficiency Loop with safety and energy monitoring demonstrations. The racetrack-configured conveyor loop displays a variety of Nercon’s adjustable guide rail assemblies, from manual to fully automated control solutions. The Oshkosh, Wis.-based company, having surpassed the 35 year benchmark, is well-known for engineering and manufacturing processing and package handling conveyor systems. Serving food and consumer goods manufacturing industries, Nercon specializes in solving manufacturing business objectives from maximizing production capacity to reducing production line down time. The quick changeover conveyor loop demonstration will help manufacturers with multiple stock-keeping units discover strategies for increasing production efficiencies. 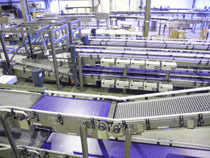 One size does not fit all when it comes to conveyors, so the first step in increasing efficiency is creating a mechanical and control solution that fits each application’s unique needs. Nercon’s quick changeover conveyor loop display allows users to test and compare several levels of changeover solutions, including quickset bracket assemblies, set-in rails, hand-wheel adjustable guide rails, and push-button automatic guide rails. An Allen-Bradley PanelView™ Plus 6 human machine interface (HMI) provides a user-friendly interface between the machine and operator monitoring the changeover. The HMI is programmed on the demonstrative loop using FactoryTalk® View ME for three recipe/product size changes. Show attendees can use the HMI screen to push a button and within seconds, both guide rails automatically adjust to the product and width selected. Users can also browse through the stored layout documents, mechanical drawings and reference manuals, easily accessed on the PanelView Plus 6 HMI. Users can learn how to improve their bottom line with the energy monitoring demonstrations, also shown on the Changeover Efficiency Loop. The display indicates power consumption over EtherNet/IP to show energy efficiencies on two different drive designs: worm and helical bevel gears. The energy demonstration is a fully integrated control solution enabled by Allen-Bradley PowerFlex 40 and PowerFlex 40P AC drives and an Allen-Bradley Stratix 6000™ managed switch on EtherNet/IP. The AC drives provide closed-loop control in a compact and cost-effective design, while the switches help ensure proper network segmentation. Further, the Stratix 6000 switch allows the end user to integrate multiple cell zones across the line and achieve secure integration at the enterprise level. In addition to displaying energy monitoring data, the PanelView Plus 6 HMI demonstrates safety strategies by displaying device status and alarms. For a fully integrated solution, the safety demonstration also combines Allen-Bradley Compact GuardLogix programmable automation controllers (PACs) with PowerFlex 40P AC drives with safe-off. The Compact GuardLogix PACs use a single development environment for standard and safety control to provide high performance, multidiscipline control for SIL 3 applications. The PowerFlex 40P AC drives with safe-off reduce panel space by 60 percent and prevent drive restarts after the safety circuit is tripped. The Allen-Bradley POINT I/O™ provides fast change-of-state connections that help maximize performance.